In order to assess prospects for the upcoming 2019 spring turkey seasons in Louisiana and Mississippi, we contacted the experts who manage wild turkeys for their respective state agencies. Cody Cedotal, Resident Small Game/Wild Turkey Program Manager is the go-to guy for the Louisiana Department of Wildlife and Fisheries (LDWF). “The 2019 season will hopefully turn out good in terms of harvest and gobbling activity,” said Cedotal. This optimistic prediction is based on several factors, one of the most important being the survey that estimates the number of poults hatched the previous year. “Prior to 1994, there were no statewide organized observations or recordings of wild turkey recruitment. As a result, there were only educated guesses based on weather patterns and casual observations,” said Cedotal. Beginning in 1994, the first statewide standardized statewide survey was developed and implemented by LDWF. “In Louisiana, the primary breeding and egg laying period occurs from late March to mid-April. Most mortality among turkey poults occurs during the first three weeks of their lives. With this in mind, the months of July and August was selected for the poult survey,” Cedotal said. Statewide, the 2017 survey of poults per hen was slightly less than one. However, the northwest portion of the state revealed the best count, 2.1 poults per hen. For this reason, Cedotal points to this portion of the state as offering hunters the best chance for success this coming spring turkey season. “Northwest and west Louisiana have had the best reproduction for the past couple of years, meaning that these areas have the state’s highest density of turkeys,” he added. Hunters are required to report the turkey harvest after each bird is taken. Of the number of hunters who took the time to follow the rule and actually reported their harvest, 1,989 turkeys were taken during the 2018 season; 1,782 adults and ,07 jakes. The parishes reporting the highest harvest were Claiborne (209), Union (163), Vernon (160) and Winn (100). All these parishes are in the northwest/western part of the state validating Cedotal’s report. How does the 2018 harvest stack up with that of previous years? Over the past 10 seasons, the 1,989 birds harvested were the sixth highest over that 10-year period. One reason for the number not being higher was a rather dramatic change in the 2018 season opening date. The 2018 season marked the first since the 1960s that turkey season opened statewide in April (April 7) instead of late March. The change was to allow for undisturbed breeding activity of gobblers and hens before hunters hit the woods. Last year’s season closed May 6. Biologists are optimistic that the season opening delay until April, coupled with the dry spring weather throughout most of the state, has resulted in a good hatch. “As of now, the poult survey for 2018 has not been totally analyzed but we’re optimistic that improved recruitment will be on par with what we expect given the conditions during nesting time,” Cedotal said. Louisiana has a number of areas open to the public for hunting and Cedotal pointed out which areas should produce the best results for the 2019 season. Cedotal’s counterpart in Mississippi, Adam Butler Wild Turkey Program Coordinator for the Mississippi Department of Wildlife, Fisheries and Parks (MDWFP) looks for turkey populations to be up across much of the state based on the projected 2018 poult survey. Mississippi has one of the highest wild turkey populationsof any state, being in the neighborhood of 250,000 birds — but there are concerns that the number of birds in the state is long-term decline. In 1987, the all-time high harvest was approximately 60,000 birds. Last year, the estimated harvest was just under 25,000. “Our numbers saw a dramatic drop between the late 1980s and early 1990’s,” said Butler. “While substantial, that crash was not totally unexpected since we were coming off the restocking era when populations exploded and likely overshot what their habitats could support. Butler targeted the southwest portion of the state as one of the better regions for turkey hunting success. “The southwest region has had the overall best reproduction the last several years and historically always held some of our best turkey populations. The central region had a bumper hatch in 2016 that should result in a significant carry over of good birds into the 2019 season. Some of the public areas seem stacked right now,” Butler said. “I’d say the southern third of the state has had a phenomenal hatch, the middle third of the state I’d call ‘okay’ and the northern third pretty slim,” he said. Regarding the weather for the previous year and the influence it had on poult production, Butler has a hint of why the outcome will be as predicted. Butler said there are some proposed changes in the works that could influence an enhanced reporting system for the 2019 season. “We have already implemented major framework changes to five wildlife management areas including Little Biloxi, Mason Creek, Marion County, Choctaw and Malmaison. These five areas will go to an April 1-May 1 season framework. This change was made to address declining harvests and to realign the season framework closer to the reproductive biology of the bird, similar to what Louisiana did last year on a statewide basis,” Butler explained. Except for the five wildlife management areas noted above, season opening statewide began March 15. Season closes May 1. Bag limits for gobblers are one bearded bird (6 inches or longer) per day; three per season. Hunters age 15 and younger may take one gobbler, any age, per day; three per season. Mike Giles, a serious turkey hunter from Meridian, travels around the state to hunt gobblers wherever they are available. “The Chickasaw wildlife management area in northeast Mississippi should be one of the best areas to try for a gobbler this spring,” said Giles. “In the east central part of the state, the Bienville, Caney Creek and Tallahalla areas are all within easy driving distance of most hunters in central Mississippi and all offer excellent opportunities to hear a turkey gobbling and to harvest one. “Moving to the southeast section, my suggestion would be for hunters to check out the Mason Creek, Leaf River and Chickasawhay management areas where hunting should be fair to good. “The Cane Mount area in southwest Mississippi near Port Gibson is chock full of turkeys but it’s a ‘draw’ only and limited to Mississippi residents,” he continued. Giles suggests that in each of these areas, hunters should first of all check area regulations to see about lottery draw hunts as most of these areas are “draw” only for the first week or so of the season. Whichever state you decide to try your luck with gobblers this spring, you’re likely to find plenty to brag about if you set your sights on hunting either or both of these two southern states, Louisiana and Mississippi. Both Louisiana and Mississippi are known not only as good spots to chase gobblers but each state has bragging rights to some of the best crappie fishing to be found anywhere, and springtime is the best time to catch a good mess of slabs. Once your gobbler is in the cooler, many turkey hunters add some extra to their time outdoors. Number one on the list of other things to do when the hunt is over is to head to one of the very popular lakes with jig pole and a box of crappie jigs and collect the makings for a fish fry to die for. One top-notch area to fill a cooler with big crappie in Louisiana includes Toledo Bend reservoir in western Louisiana, where the crappie grow big and feisty. 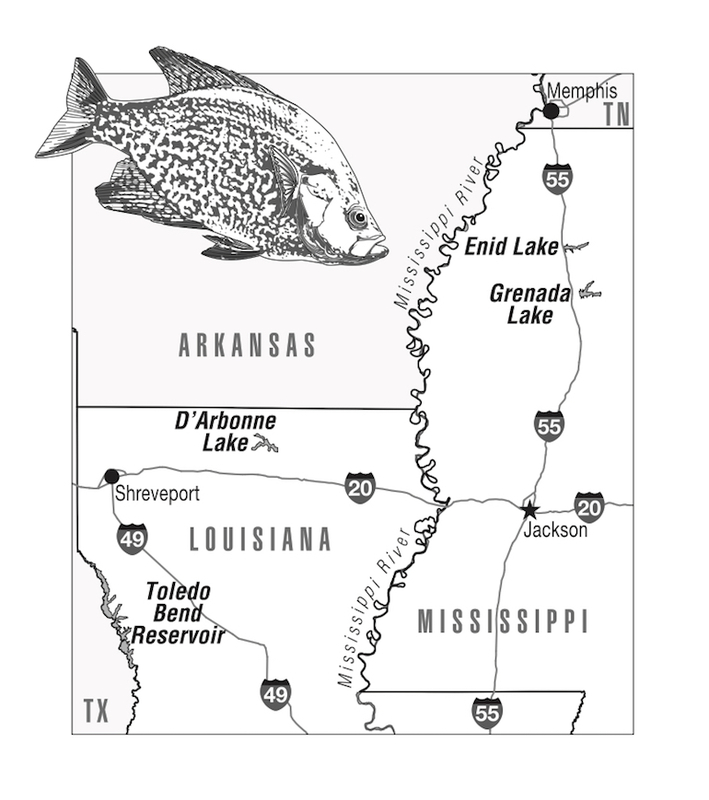 Another is Lake D’Arbonne, a 15,250-acre lake in north Louisiana well known for hosting nationally sanctioned crappie tournaments. In Mississippi, there are two popular crappie havens along Interstate 55 between Jackson and Memphis. Grenada Lake is a 35,000-acre crappie hot spot that annually attracts anglers from across the country. Enid Lake is smaller but its 6,100 acres belies the big slab-sized crappie this lake is known for.